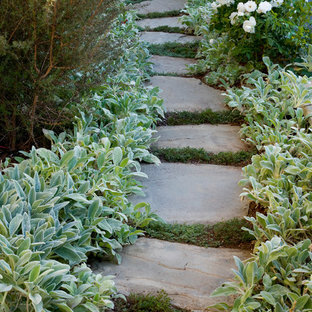 Flagstone stepping stones with ground cover between. For natural landscaping that brings beauty to your home or business, contact the professionals at Stout Design-Build, where we offer you a range of landscape design and building services that are . . . "Organic. Responsible. Naturally!" Stout Design-Build is a full service designing and building firm that offers a variety of residential and commercial services. We can help you with landscape design, landscape construction, building construction, and more. Our professionals have 20 years of design experience. We work with LEED certified, Green Point Rated, and standard properties. We focus on designing you a landscape that is efficient and beautiful with natural products from plants to patios, and with the implementation of water and energy conservation. We also renovate homes and offer them up for sale, providing you with stylish living at affordable prices. Everything we do is environmentally friendly, with great craftsmanship, so you will always get the best in quality whether you need landscape design and building or one of our other services. 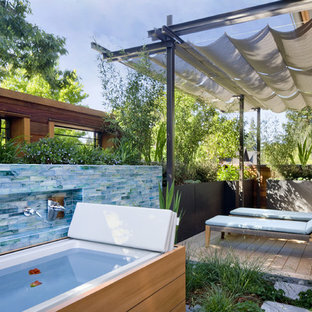 Contact the professionals at Stout Design-Build in Los Angeles, CA to get beautiful landscape design and professional quality services. Call 310-876-1018 to set up your consultation! A Memorial-area art collector residing in a chic modern home wanted his house to be more visible from the street. His yard was full of trees, and he asked us to consider removing them and developing a more modern landscape design that would fully complement the exterior of his home. He was a personal friend of ours as well, and he understood that our policy is to preserve as many trees as possible whenever we undertake a project. However, we decided to make an exception in his case for two reasons. For one thing, he was a very close friend to many people in our company. Secondly, large trees simply would not work with a landscape reflective of the modern architecture that his house featured. The house had been built as story structure that was formed around a blend of unique curves and angles very reminiscent of the geometric patterns common in modern sculpture and art. The windows had been built deliberately large, so that visitors driving up to the house could have a lighted glimpse into the interior, where many sculptures and works of modern art were showcased. The entire residence, in fact, was meant to showcase the eclectic diversity of his artistic tastes, and provide a glimpse at the elegant contents within the home. He asked us to create more modern look to the landscape that would complement the residence with patterns in vegetation, ornamentation, and a new lighted water fountain that would act like a mirror-image of the home. He also wanted us to sculpt the features we created in such a way as to center the eye of the viewer and draw it up and over the landscape to focus on the house itself. The challenge was to develop a truly sophisticated modern landscaping design that would compliment, but in no way overpower the façade of the home. In order to do this, we had to focus very carefully on the geometric appearance of the planting areas first. Since the vegetation would be surrounding a very large, circular stone drive, we took advantage of the contours and created a sense of flowing perspective. We were then very careful to plant vegetation that could be maintained at a very low growth height. This was to prevent vegetation from behaving like the previous trees which had blocked the view of the house. Small hedges, ferns, and flowers were planted in winding rows that followed the course of the circular stone driveway that surrounded the fountain. We then centered this new modern landscape plan with a very sophisticated contemporary fountain. We chose a circular shape for the fountain both to center the eye and to work as a compliment to the curved elements in the home’s exterior design. We selected black granite as the building material, partly because granite speaks to the monumental, and partly because it is a very common material for modern architecture and outdoor contemporary sculpture. We placed the fountain in the very center of the driveway as well, which had the effect of making the entire landscape appear to converge toward the middle of the home’s façade. To add a sense of eclectic refinement to the fountain, we then polished the granite so that anyone driving or walking up to the fountain would see a reflection of the home in the base. To maintain consistency of the circular shape, we radius cut all of the coping around the fountain was all radius cut from polished limestone. The lighter color of the limestone created an archetypal contrast of light and darkness, further contributing to the modern theme of the landscape design, and providing a surface for illumination so the fountain would remain an established keynote on the landscape during the night. Colored concrete with decorative rock channels for water infiltration. 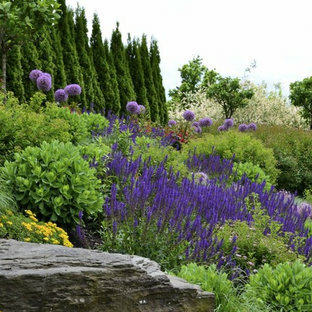 For natural landscaping that brings beauty to your home or business, contact the professionals at Stout Design-Build, where we offer you a range of landscape design and building services that are . . . "Organic. Responsible. Naturally!" Stout Design-Build is a full service designing and building firm that offers a variety of residential and commercial services. 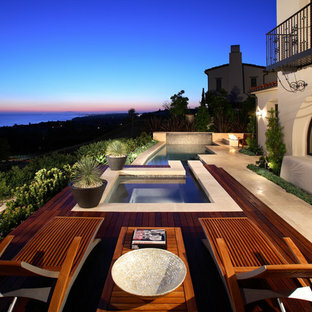 We can help you with landscape design, landscape construction, building construction, and more. Our professionals have 20 years of design experience. We work with LEED certified, Green Point Rated, and standard properties. We focus on designing you a landscape that is efficient and beautiful with natural products from plants to patios, and with the implementation of water and energy conservation. We also renovate homes and offer them up for sale, providing you with stylish living at affordable prices. Everything we do is environmentally friendly, with great craftsmanship, so you will always get the best in quality whether you need landscape design and building or one of our other services. Contact the professionals at Stout Design-Build in Los Angeles, CA to get beautiful landscape design and professional quality services. Call 310-876-1018 to set up your consultation! 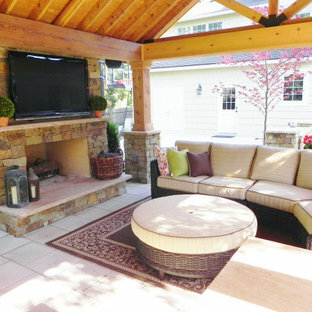 Kalinosky Landscaping Inc. http://www.kalinoskylandscapinginc.com/ Project Entry: The Waverly Residence 2013 PLNA Awards for Landscape Excellence Winner Category: Residential $60,000 & Over Award Level: Honorable Mention Project Description: The residence is located in an upscale suburban sub-division in Northeastern Pennsylvania. The home was designed by an architect from California and is decidingly modern and abstract compared to neighboring homes. The architect was direct in his charge that the landscape be bold, colorful and modern, similar to projects he has worked on in California where the climate and culture allows. The owners embraced this concept adding only that privacy was important. Our main challenge was to find ways to provide the desired spirited and colorful landscape utilizing cooler climate plantings, and to push the limits on the abstract hardscape design without alienating the conservative community. We believe we have achieved our goals as both the demanding architect and discerning homeowners are extremely pleased with the results. This modern landscape has also been embraced by the community. Relative to site problems and scope, we had extensive drainage issues and encountered solid rock near or at the surface. We hydro-hammered out layers of rock to allow the installation of several feet of topsoil and an extensive network of drain tiles to evacuate water constantly flowing from springs we encountered. The topsoil was stripped from the site prior to the start of construction and stored on an adjacent lot. We utilized a portable screening plant, processing the topsoil and adding about 1500 tons of additional purchased topsoil. We designed a modern and abstract concrete wall system to separate the public and private spaces in the front of the residence. A people court was designed again utilizing concrete walls to articulate this space and provide a private environment for our clients. This space is viewed and accessed from the bedroom and entry areas of the home. We added a simple water feature of appropriate volume to provide sound, and at night illuminated reflecting qualities to the people court. Extensive screening was utilized to softly cloister the home and screen a large solar array that provides electricity for the home. A lush, almost tropical looking planting was provided for a large sunken area to offer relief to the lower living spaces. A rear terrace was constructed of exposed aggregate concrete. Near this terrace is a bold, modem, concrete water feature and a gas fire pit. 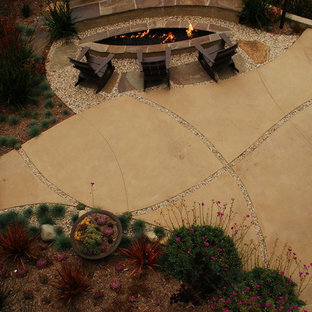 The gas fire pit was custom built by a firm in Colorado utilizing hand-hammered metal and heat induced patinas. This terrace overlooks the sloped perennial garden. We finished the rear space with a calm stone arrangement emerging from raked pea gravel dry lake. This viewed from a stone bench we constructed of thermalled bluestone. An extensive highly technical lighting system was installed utilizing bronze fixtures controlled by an array of computer linked touch pads throughout the home. 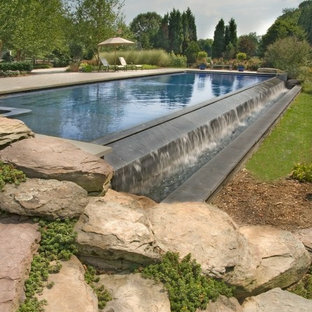 An infinitely controllable irrigation system with over twenty-five zones was installed. This coupled to a dedicated deep drilled well provides stability during dry periods. Specimen trees and shrubs were brought in from nurseries throughout the country. We specified only the finest we could find. This has given the site a feel of maturity while being quite young. 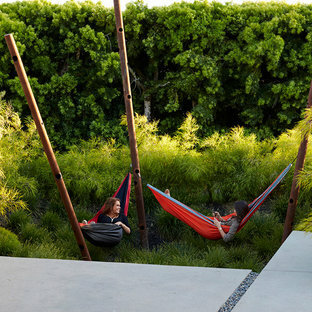 Photo Credit: Kalinosky Landscaping Inc.